We Have Our Second Graduate! Recently, my wife and I got to attend a special graduation. 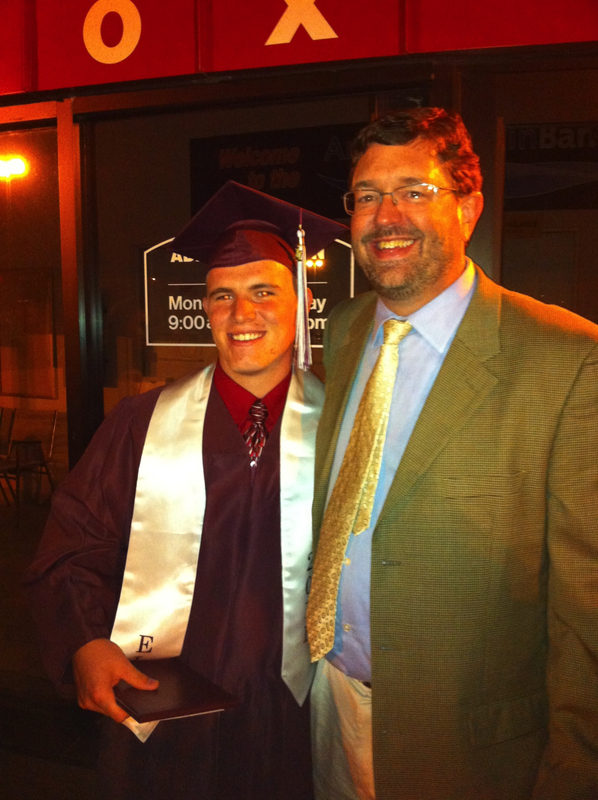 Corey is my second student from the virtual project-based program to earn his high school diploma! The virtual project-based program allows students to earn credit by designing and doing projects that they correlate to state learning targets. They earn the credit for their projects as soon as they complete them (demonstrating mastery of those learning targets), which makes the program great for kids who are behind in credits or have been out of school. It is a program, so students remain associated with their sending school. Corey is a pretty normal kid, loves to play baseball and hanging out with his friends, but health issues had made it difficult for him to keep up academically. The virtual program provided the flexibility for Corey to complete his graduation requirements so he could march with is classmates. Corey worked hard, earning 7 credits in 8 months! Corey will be attending college in the Fall, where he will be playing baseball. This entry was posted in Multiple Pathways, Projects4ME and tagged Multiple Pathways, virtual on June 17, 2011 by Mike Muir.